When this band was brought to my attention, I was excited because I had read they were being compared to Guns N Roses. Of course, GNR’s name is often thrown around for and by many unknown bands who are trying to get noticed. So what was my honest take after listening to the first handful of songs? They aren’t similar to GNR at all. 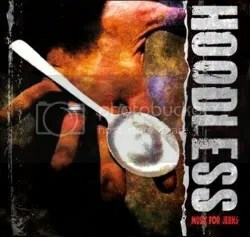 I have listened with an open ear (two, actually) and I just do not hear where you can draw the line between these two bands but I do not think it would be too far off to say that GNR fans would appreciate Hoodless. The band’s sound is something that I think would appeal to old school rock heads and to the alternative crowd as well. In fact, I can’t help but feel like ex-Warrant vocalist Jani Lane is singing on this album as Twon’s vocals sound very much like him at times and some of these songs sound similar to Saints of the Underground or some of the later (aka- alternative) Warrant albums with Lane. Don’t get me wrong, I’m not trying to say these guys are some Warrant-worshipping retro act. Not at all. They are a completely modern band. It’s just that I can’t get over Twon’s vocals sounding so similar to Jani’s. What I really like about this album and band is that they aren’t heavy just to be heavy or trying to sound like a party band or angry band or whatever. There’s tons of groove to this album, some nice melodic moments. There is a balance between heavy and harmony that many young bands completely miss the boat on. “Be My Whore” and “Why So Serious” are pretty heavy numbers but then there are lower key moments like “Run Away” or “Innocent” that, while heavy own their own terms, still show a ton of musical sensitivity. They aren’t beating you over the head with thick guitars just because they can. So Music For Jerks turned out to not be what I was expecting but it is still a very good album. Besides, who needs another GNR Lite? We’ve had hundreds of those dating back more than 20 years! Hoodless is doing their own thing and that’s all they need to keep doing. Definitely an album worth checking out.